Zenyatta is one of the great mares in racing history. 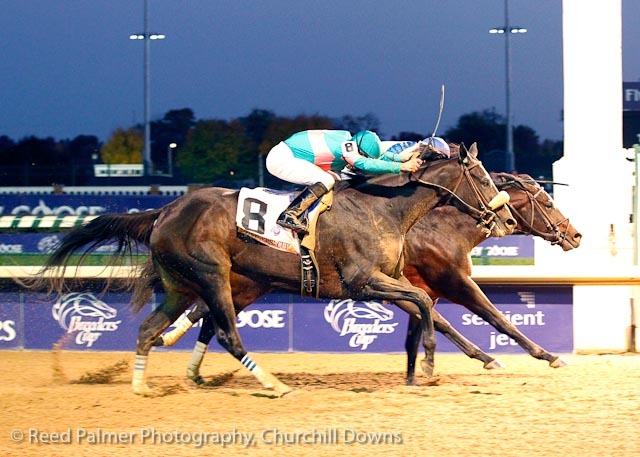 Her owners, Jerry and Ann Moss, planned to retire the six-year-old after the 2010 Breeder’s Cup Classic in Louisville, Kentucky on November 7th. Instead of retiring with a perfect record of twenty wins, which would have been the best of any American horse in the history of Thoroughbred racing, she came in second by a head to a horse named “Blame” in her last important race. 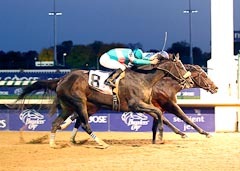 More than her one loss however, Zenyatta’s record of nineteen wins out of twenty starts should be her lasting tribute. 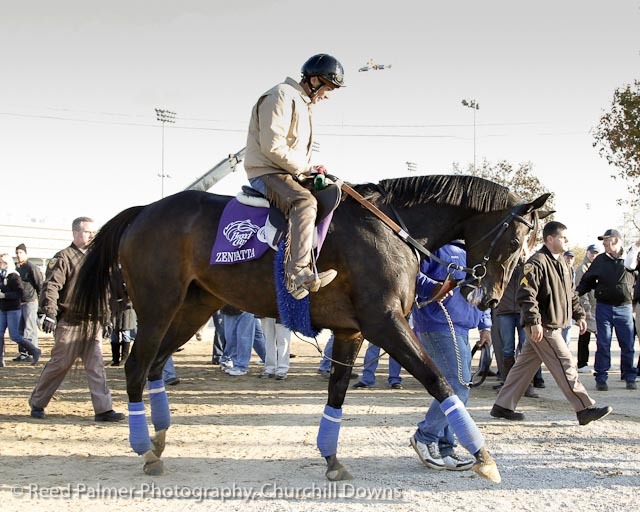 Crowds lined the area where the 17.2 hand Zenyatta, like a Hollywood starlet, walked to the paddock to be saddled. People yelled and cheered their encouragement while her handlers tried to shush the noise, hoping to lessen the pressure on her. She showed her nervous anticipation in her characteristic walk, lifting her right front foot, and sometimes her left, in a dressage-like extension, as if pawing the air. The announcer called it a dance movement. Maybe they will name it the Zenyatta Step. We all watched as horse number eight in the 2010 Breeder’s Cup Classic headed for the starting gate. She entered without problem and stood waiting. We saw her come out of the gate more slowly than we hoped for and follow the pack of eleven other horses for way too long! We urged her forward, urged her on to find her way to the front! And then she came, fighting to get there, finally getting through the bunched pack to enough space where she could move out. She tried. She gave it everything she had. She lost by a head. And we all felt that moment of heartbreak, for her Hall of Fame jockey Mike Smith, her trainer John Shirreffs, her owners, her dedicated fans at her home track of Hollywood Park and for all those others who have grown to admire this fantastic mare. Zenyatta came up from dead last to almost win. As the sunset cast a rosy glow over Churchill Downs, she was led back to the barn for the first time without her moment of glory in the winner’s circle—while Mike Smith, her jockey, fought to control his emotions over perhaps his greatest loss. Her trainer, John Shirreffs, walked back with his head down, hands in his pockets. Her owners seemed stunned. Did we expect her to be invincible? Didn’t we expect her to come up from behind once again as she had done so many times before with her thrilling power and heart to win and to cross the finish line with her usual last-minute triumph? Things happen. If anything, blame the dirt thrown in her face from the flying feet in front of her. She was used to the synthetic track at Hollywood Park. But in spite of the dirt and the late start, she gave it her all, as mares do. Speaking for women in general, many of us know something about the pressure to win in a male-dominated sport. Zenyatta definitely has the heart of a winner and we will remember her valiant try. This mare has won the hearts of countless fans. As consolation perhaps, Zenyatta walks away from the sport as the richest mare in Thoroughbred history. Now she’s at her new home, grazing comfortably amongst the brood mare band at Lane’s End Farm in Kentucky. May her babies continue her legacy! Betsy Kelleher is a columnist for the Illinois Horse Network and the author of two books. We are pleased to welcome her as a contributor to High Minded Horseman. Comments for "Zenyatta; A Mare’s Heart to Win"
Carol Upton on January 04, 2011 What a beautiful article with a unique perspective!